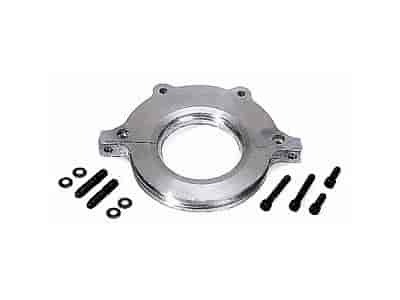 Manufactured from billet aluminum, this adaptor allows you to use a 2-piece rear main seal crank in a 1-piece rear main seal block. It also allows you to use the factory 2-piece rear main seal oil pan. Allows the use of 1986-earlier Small Block Chevy crankshafts and oil pans (with 2-piece rear main seal) in 1987-92 blocks (with 1-piece rear main seal). Billet aluminum adapter is machined to accept the factory oil pan seal, instead of having to fill up the adapter with silicone. Includes fasteners, and will work with pre-1980 oil pans.